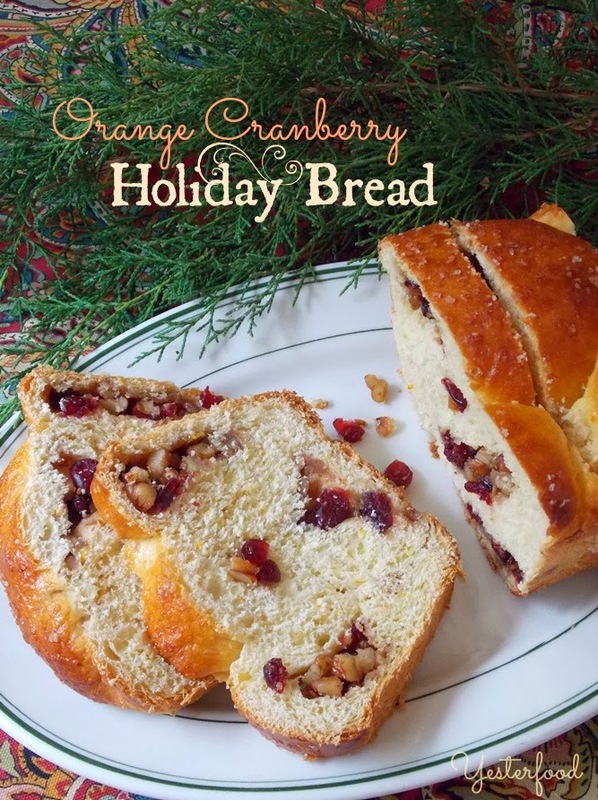 Orange Cranberry Holiday Bread has layers of sweet cranberry, pecan, and brown sugar filling woven throughout tender, orange-scented bread. 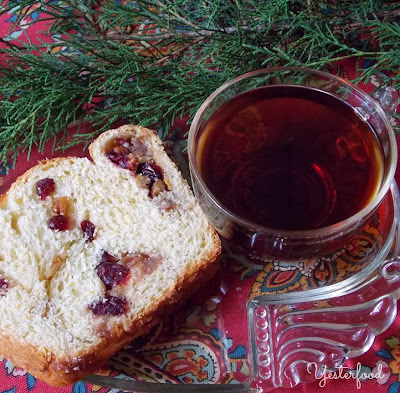 Try it on a holiday morning or afternoon with a cozy cup of something warm. 1. To make the bread: Combine the starter ingredients, cover, and leave at room temperature overnight. 2. The next day, mix the starter with the dough ingredients (except the reserved egg white), kneading until elastic and satiny (about 5 minutes in a stand mixer). Spray a large bowl with cooking spray. Place dough in the bowl, then turn the dough over so that the top is greased. Cover and let rise until doubled in size, about 1 to 2 hours (depends on how warm the room is). 3. When the dough is almost risen, prepare the filling. In a medium bowl, mix the cranberries, pecans, and brown sugar together. Drizzle with the melted butter and mix well. You will have a somewhat loose, wet, sandy texture. Set aside. 4. Punch the dough down, then turn out onto a lightly floured surface. Divide dough into three equal pieces and flatten each piece into a rectangle about 4" by 12". If the dough is springy and difficult to flatten, get it as far as you can, let it rest for a couple of minutes, and then try again. 5. Sprinkle each rectangle of dough with a third of the filling, keeping it in a long strip down the middle of the dough. Starting with a long edge, fold each rectangle over in half, encasing the filling. Pinch to seal and lay seam side down. 6. You now have three, 12" long ropes of filled, sealed dough. Put the three ropes together, pinch the tops together, and braid. Tuck ends under. 7. Spray a 9" or 10" loaf pan with cooking spray. (An 8" X 4" loaf pan will be too small). Carefully transfer braid to pan. Cover and let rise until doubled in size, about 1 to 2 hours; it will depend on the temperature of the room. NOTE: You can let the braid rise on, and then bake on, a greased cookie sheet. It will be a little larger and flatter than if baked in a pan. 8. Preheat the oven to 350 degrees. Brush top of risen braid with reserved egg white, then sprinkle with sparkling sugar. 9. Bake the braid for about 30 minutes, until golden brown. Let cool before cutting. Orange Cranberry Bread was baked for World Bread Day. Hundreds of bloggers from all around the world bake bread for this special day. It's a day to have fun and unite with other home bakers, but it’s also a day to honor our daily bread, to be grateful to have enough food, and to heighten awareness of world hunger. Grace, I do like the way you think! ;) I let the bread rise a little too far on the second rising, but it was still really good. :) Thank you so much for coming by! This bread looks so delicious. I bet it would be great on Christmas morning. Thanks for participating in World Bread Day. Megan, that really does sound good, to have this for Christmas morning with a great cup of coffee or tea. :) This is the second year I have baked for World Bread Day; I enjoy it! Hi Joy. Your bread looks amazingly delicious! I'm disappointed because I didn't know it's World Bread Day and I happen to be making bread today! Thanks for sharing your recipe with us and have a beautiful day. That bread looks delicious! I love making bread from scratch and if it wasn't going to be 89 here today I might even make some in honor of World Bread Day -- but not today! The dough would rise fast! Joy, this bread looks so yummy. Very pretty, too. I love to bake bread from scratch, but have never tried my hand at a sweet yeast bread. May have to try this one, though. Thanks for sharing the recipe. Looks like a good one for Christmas morning! Wonderful loaf I can nearly smell its heavenly scent through the screen. ;-) Thank you for participating in World Bread Day 2013! Love this recipe! Have you, or know anyone that has, tried it gluten free? This is a beautiful bread, Joy. I love your description of cranberries, pecans, and brown sugar "woven" through the loaf. How nice would it be to wake up to this for breakfast Thanksgiving or Christmas morning?! Looks so beautiful and delicious. 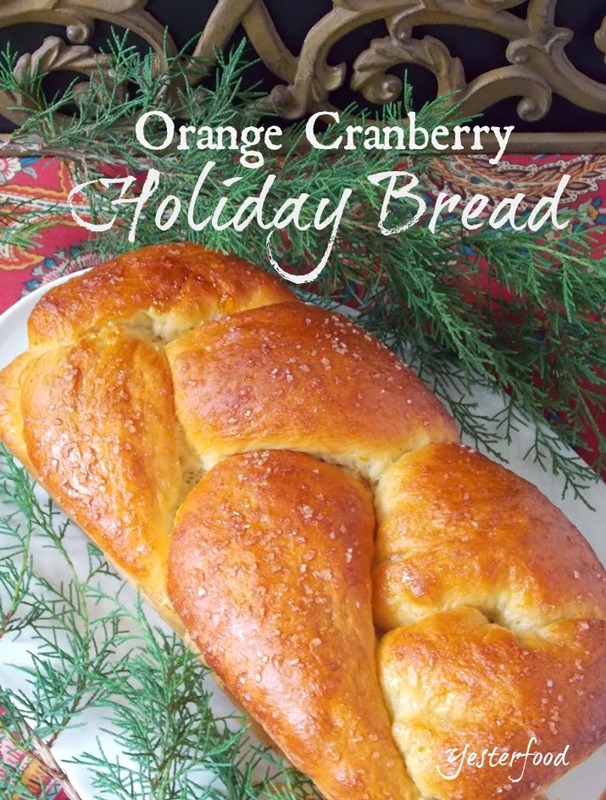 It reminds me very much of a Bulgarian Holiday bread we make. Pinning and saving your recipe. Hope to try it out very soon! Winnie, I am so happy you liked the filling- we really enjoyed the flavors. :) Thanks for stopping by! This bread looks so delicious! I love making bread and lately I have been craving cranberries! Thanks for sharing at the Home For the Holiday link party! Thanks, Cynthia! It really does have the seasonal flavors. :) Thank you for Home For the Holidays! What a great recipe, I think I could actually make it without destroying it...thanks for sharing. Happy Sharefest. This sounds really good! Thanks for sharing your recipe with this week's Throwback Thursday party. I was browsing around and came across your blog, thisBread looks amazingly delicious. Thank you for the recipe. I will come back soon.